Antigua tours and excursions: Antigua Rainforest Canopy Tour. 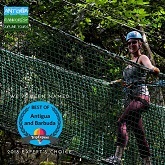 Antigua Rainforest Canopy Tour has copped the Experts Choice Award for Antigua’s best attraction. 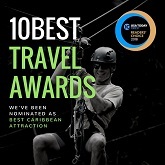 Antigua Rainforest Canopy Tour has been nominated as one of the Caribbean's Best Attractions in USA Today 10Best Travel Awards. Introducing Antigua’s most exciting tour where you can pack the most fun & excitement into one day on one island. 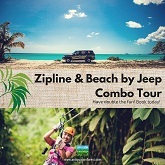 Get the latest zip line pricing and rates for zipping with Antigua Rainforest Canopy Tour. The Antigua Rainforest Canopy Tour recently received a Trip Advisor Certificate of Excellence 2014 for the many positive reviews it garnered. Princess Guests Pick Antigua Rainforest Canopy Tour as the Best High Volume Tour in Antigua. NEW 12 EXCITING ZIP LINES PLUS 4 AMAZING AERIAL WALKWAYS!